The course offers a complete module organised around a number of classes on the subject of P.C.M. 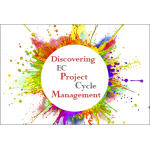 (Project Cycle Management) mainly focusing on Euro-projects, meaning on projects co-funded by the European Commission. We tried to offer both basic and more advanced information on the subject in a rather consequencial and exhaustive manner. For additional information, please refer to the explanatory tables provided per class.